Joomla has been making giant strides in the Internet ambit ever since it made its debut. The last few years have witnessed it come the leading content management system and a blogging platform. There are various reasons that have shouldered it to be the top billed CMS today, and they continue to increase in numbers with each day. But that said, surely would be an overstatement when we say that Internet is awash with coders who are prying on different websites to break in and wreak havoc on them. These hackers inject codes that let them gain an unauthorized access to your blog, upon which they can afflict some major blows to your blog and render it worthless, if that’s what they intend to do. Installing some security extension that guards your blog against such malicious folks and lets it continue its normal operations is highly recommended. Because once your blog is hacked, there is every possibility that you will be forced to bring it back up right from the scratch. Arguably, that is a prospect you won’t like to keep in your calculations. Among the many such extensions available, there are home hugely popular ones like JISecure My Site take the security levels of your site several notches higher. The biggest incentive with using the security plugins of Joomla are that they are easily available and you do not have to go fishing for them. Also, for the fact that it is Joomla that endorses them, you can be rest assured they are reliable. Haven’t you already been warned against the dicey hosting providers who offer web space at ridiculously low prices to lure their customers, and once your website is live on it, the cracks begin to show, and they begin to show rather starkly. Still, many blog and website owners appear to be ignoring this fact, primarily due to the savings they make on the budget. The fact that they may face a lot of nuisance in the long run with their Joomla website appears to be acceptable in the face of low prices. Take this, a not so reliable service provider won’t be going for the regular server updates, they won’t offer a backup facility and they would most likely host your site on a server hat keeps crashing. This leads to your website facing downtimes much too often. And this is where Google starts to punish your site when your visitors get 404 errors or “The Page cannot be displayed” messages. Henceforth, spend a few extra bucks even if that means stretching your budget if you wish your endeavor to be a success. Heard of it yet? If you haven’t, then make sure you give this tool all your attention because it deserves so. 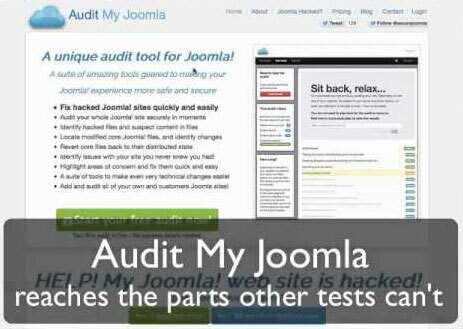 An incredible tool to ensure authenticity on your Joomla site, the Joomla audit tools protect it from hackers in a way nothing else does. If you have a difficulty in finding or choosing one for your blog, I would recommend MyJoomla. It is a highly intuitive tool that lets you to easily determine if someone has penetrated your website or not. As and when the important files in your website are modified – by authorized or unauthorized users – this tool lets you know that promptly. It might happen much too often that you don’t realize that your website has already been held hostage by a hacker from days, but MyJoomla will make sure you stay up to date with any security discrepancies on your site. In the event your fears come true and your website indeed gets hacked or intercepted by a malicious coder, you must have something to fall back to. And your website would be our savior. This would arguably be the biggest web development mistake you can make if you fail to take a backup of your site. Joomla facilitates taking backup seamlessly. Depending upon how frequently you update your site, the backup has also to be taken proportionally. Whether you are installing new plugins, or adding content to your site, it has to be saved on alternate storage. When a website is one of the major sources of your income, it becomes all the more important to keep the security threats at bay. This article is written by Edword Jones. He is a web developer by profession and a writer by hobby and works for Custom Joomla Development company OSSMedia Ltd.. He loves sharing information regarding WordPress, Magento, Drupal and Joomla development tips & tricks. If you are looking for Hire Joomla Programmers then just get in touch with him.